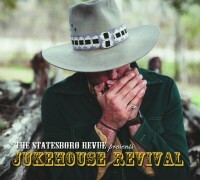 Stewart Mann and his brother Garrett have been fronting the southern rock outfit Statesboro Revue for a number of years now. Stewart’s voice is evocative, versatile, powerful and soulful. Garrett’s guitar playing is drenched in the traditions of Allman and Betts. It has always provided a groovy, rollicking signature sound. With their newest studio release, Jukehouse Revival, the Mann brothers have pushed their Revue in a more countrified direction. It’s like a swampy honky-tonk sound that’s hard to describe exactly until you hear it. It has elements of Willie Nelson, Allman Brothers, Skynyrd and Willie Nelson…all the while remaining entirely Statesboro. Their set at #GF15 was a highlight. It seems as though the band has finally landed upon its true, signature sound. It’s a potent mix of the southern rock they’ve always cranked out, but the raw, authentic elements of the best type of country music is now prevalent as well. It’s a potent hybrid that makes the title of this record feel entirely apporporiate. Stewart’s vocals have always been a calling card for the band, and here he is using that instrument at its most effective. “Bedroom Floor” and “Count On Me” show a restraint he hasn’t previously mastered. Yet, make no mistake, he can still let it fly and he does on tracks such as the Adam Hood co-write “Tallahassee” and “Like the Sound of That”. This is the sound of a band reaching an apex. Sit back and enjoy it. In a crowded field of standout 2015 releases, Jukehouse Revival, stands shoulder to shoulder with the best. It’s a grooving, honky-tonk good time put on wax. Turn it up. Got my copy of the new album last week and it has been on repeat in the truck now for days. Once again the brothers Mann have recorded a rich engaging album that hits all the sweet spots. I have been a fan for a few years now and have watched this band jump to a new level.Garret Mann has become a lead guitar player that has reached the level of greatness. He turned a corner a year ago and never looked back. The base line is strong with Ben and Kris, one of my requirements and the addition of Travis Bishop on keyboard round out this group. Buy the CD and be sure to see them at your favorite venue. Go buy the album from wherever you can. I simply want to say I’m all new to blogs and honestly savored this web blog. Probably I’m likely to bookmark your blog . You surely come with tremendous articles and reviews. With thanks for sharing your website. Thanks for some other fantastic article. The place else may just anyone get that type of information in such a perfect approach of writing? I’ve a presentation next week, and I’m at the look for such information. Thanks for sharing excellent informations. Your web-site is so cool. I am impressed by the details that you¡¦ve on this web site. It reveals how nicely you understand this subject. Bookmarked this website page, will come back for more articles. You, my pal, ROCK! I found just the information I already searched everywhere and simply couldn’t come across. What a perfect website.